These elegant notebooks/journals are the perfect size for carrying with your Bible. Use as a daily journal, a place to record blessings or take notes, a guest book… the uses are nearly endless. 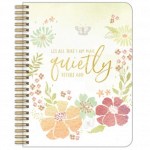 With the lovely design on the front and/or inspirational quotes and verses, these also make great gifts for holidays, occasions, and hostesses. Be the first to review “Wait Quietly” Click here to cancel reply.